For many families in DeKalb County School District (DCSD), a school serves many purposes. There’s the obvious: a haven for learning, social interaction, and growth; and there’s also the expected: preparing students for a successful future. And then there’s the not so obvious: providing meal service and essentials to families in need—even when school is not in session. DCSD’s School Nutrition Services and its Department of Parent & Family Engagement partnered with an anonymous donor and the Atlanta Community Food Bank on April 1 and April 2 to provide meal service during Spring Break 2019 at Indian Creek Elementary and Snapfinger Elementary schools. Attending families received a hot lunch, non-perishable breakfast foods, health services, and other pantry goods. 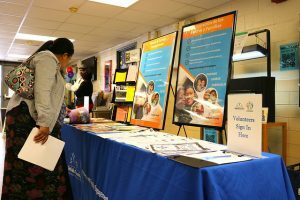 In addition, families had the opportunity to receive free health services courtesy of the DeKalb County Board of Health, DeKalb County Parks & Recreation, Georgia State University, the Dairy Alliance, and more. Volunteers from DCSD’s custodial staff, interpretation staff, and warehouse staff also gave their time to help each community. 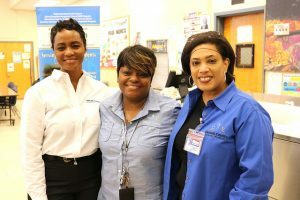 According to Dr. Vasanne Tinsley, Deputy Superintendent for Student Support & Intervention, the meal service during Spring Break is part of DCSD’s mission of providing “wrap-around” services to all families within the district—not just those that attend DeKalb County schools. Dr. Tinsley said Student Support & Intervention and School Nutrition Services is always open to forging new partnerships with volunteers, non-profit organizations, and local resources. According to Dr. Connie Walker, Executive Director of School Nutrition Services, Indian Creek Elementary served approximately 850 lunches during the two-day event. Snapfinger Elementary served approximately 300 lunches. Dr. Walker said the meals served are just a small step in the right direction for the DCSD community overall, which has a free and reduced lunch rate of 64 percent districtwide. Dr. Walker said students also received a book bag filled with even more food supplies, including recipes, to help them throughout the week of Spring Break 2019.